There's nothing like spoiling a surprise just hours before it becomes official, we're sorry. (Not really.) Samsung is set to announce its latest addition to the Note series of phones later today at IFA in Berlin. As we've seen many times in the past, secrets rarely wait to be told, and an image of the brand new handset has already made its way out into the world. But the image reveals a special treat: Samsung is having twins! 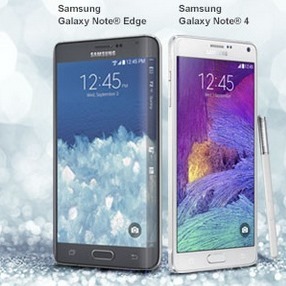 As we can see from the promotional graphic, a pair of flagships will be appearing at the announcement today. 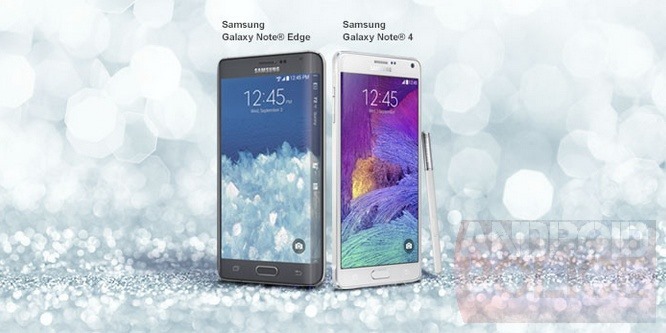 The first, as we already expected, is the Galaxy Note 4. Alongside it will be a brand new device called the Galaxy Note Edge, featuring a curved display that wraps around to the edge of the phone. We've seen trademarks for the Note Edge and a couple of patents for this type of display, and there have even been a few rumors, but no substantial signs of a product release before now. We're still not sure from the picture if the screen of the Galaxy Note Edge curves around both sides or just the right edge, but the corners look just different enough that I would lean towards thinking it's symmetrical. From the photo, it's easy to see that notifications will consume most of the additional pixels. We still don't have any additional details on specs or features, but it's only a matter of hours until Samsung gives us the full story.